Yes, it really is getting closer to that time of year when us parents need to start finding gifts for the children that will last longer than a few hours and that will hold their attention span long enough for us to have a breather. In an attempt to be vaguely organised I've decided to start hunting for gifts and I will post any good ones that I manage to find in my Christmas Gift Ideas section. I'm even going to look for gifts for parents, grandparents and friends so keep a look out! The first gift I've found is one that most young boys and girls age 3+ will love: The Peppa Pig Muddy Puddles Jumbo Jet. My son and nephew are huge Peppa fans (George is Chunk's favourite because he is a fellow dino fan) so as soon as they saw this box they were literally jumping with excitement. 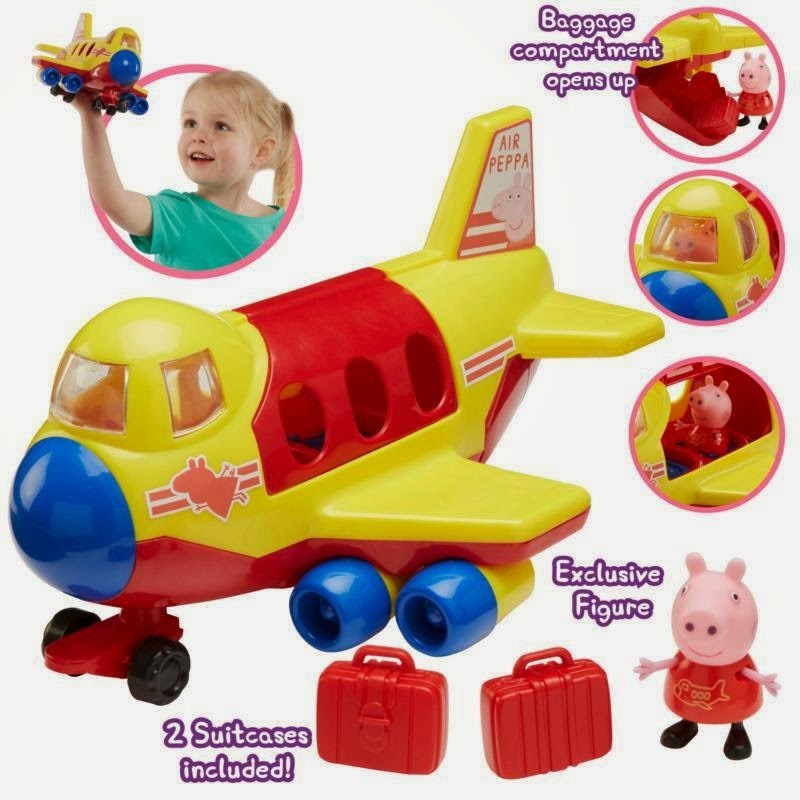 The Peppa Pig Muddy Puddles Jumbo Jet comes with a Peppa Pig figure and two suitcases, and you can of course add any Peppa figures you already have as the jet passengers. The red and yellow jet has opening doors, a luggage compartment and free-wheeling wheels which kept Chunk and Curly entertained for a good amount of time (e.g. enough for me to peel the spuds and veg and enjoy a well-earned cuppa). Initially I thought the only thing I would have loved to add to this jet would have been some sounds, but actually when I thought about how much his singing trucks drive me insane on a daily basis, I quickly realised that the jet is amazing! Chunk and Curly were busy flying it around the living room with their own sound effects which I much preferred! If you think this will be a great gift for your child, you can buy it from Character. I was given this toy to test for the purpose of this review. No payment was received, so all opinions are honest and my own. My daughter likes this aeroplane. I like the Peppa Pig toy collection. looks like good quality, I was looking for an aeroplane for T last Christmas but couldn't find anything, this would have been perfect. You're quick. We only got ours the other day, and although it's been played with, I still need to write my review. This looks good, I am sure my daughter would like this for Christmas.